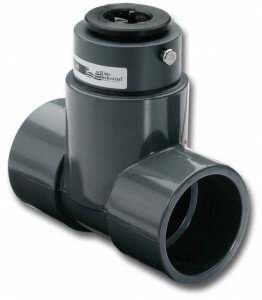 The Badger Meter 228PV flow sensors are designed to measure water flow in PVC pipes. These sensors consist of a removable, nonmagnetic sensor in a schedule 80 PVC tee with solvent-weld socket end connections. Sensors are available in 1-1/2" to 4" (3.8 to 10.2 cm) sizes. Badger Meter Impeller flow sensors feature a closed, six-bladed impeller design, using a proprietary, non-magnetic sensing technology. The forward-swept impeller shape provides higher, more constant torque than four-bladed impeller designs, and is less prone to fouling by water-borne debris. The forward-curved shape, coupled with the absence of magnetic drag, provides improved operation and repeatability, even at lower flow rates. As the liquid flow turns the impeller, a low impedance signal is transmitted with a frequency proportional to the flow rate. Sensors of similar type are interchangeable, so there is no need for recalibration after servicing or replacement. Solvent Weld - BSP - Flanged models 1 1/2" to 4"
Solvent Weld models 1 1/2" to 4"